PLAY: Move of 2. The card may be put next to all sizes of herbivores. FACT: The European saber-toothed cats are often wrongly called “saber-toothed tigers”. Saber-toothed cats belong to their own genus. Homotherium (also known as the scimitar-toothed cat or scimitar cat) is an extinctgenus of machairodontine saber-toothed cats, often termed scimitar-toothed cats, that inhabited North America, South America, Eurasia, and Africa during the Pliocene and Pleistocene epochs (4 mya – 12,000 years ago), existing for approximately 4 million years. It first became extinct in Africa some 1.5 million years ago. In Eurasia it survived until about 30,000 years ago. In South America it is only known from a few remains in the northern region (Venezuela), from the mid-Pleistocene. The most recent European remains of Homotherium date to 28,000 years BP. Homotherium reached 1.1 m (3.6 ft) at the shoulder and weighed an estimated 190 kg (420 lb) and was therefore about the size of a male African lion. Compared to some other machairodonts, like Smilodon or Megantereon, Homotherium had shorter upper canines, but they were flat, serrated and longer than those of any living cat. Incisors and lower canines formed a powerful puncturing and gripping device. Among living cats, only the tiger (Panthera tigris) has such large incisors, which aid in lifting and carrying prey. The molars of Homotherium were rather weak and not adapted for bone crushing. The skull was longer than in Smilodon and had a well-developed crest, where muscles were attached to power the lower jaw. This jaw had down-turned forward flanges to protect the scimitars. Its large canine teeth were crenulated and designed for slashing rather than purely stabbing. It had the general appearance of a cat, but some of its physical characteristics are rather unusual for a large cat. The limb proportions of Homotherium gave it a hyena-like appearance. The forelegs were elongated, while the hind quarters were rather squat with feet perhaps partially plantigrade, causing the back to slope towards the short tail. Features of the hind limbs indicate that this cat was moderately capable of leaping. The pelvic region, including the sacral vertebrae, was bear-like, as was the short tail composed of 13 vertebrae—about half the number of long-tailed cats. The unusually large, square nasal opening, like that of the cheetah (Acinonyx jubatus), presumably allowed quicker oxygen intake, which aided in rapid running and in cooling the brain. As in the cheetah, too, the brain’s visual cortex was large and complex, emphasizing the scimitar cat’s ability to see well and function in the day, rather than the night as do most other cats. 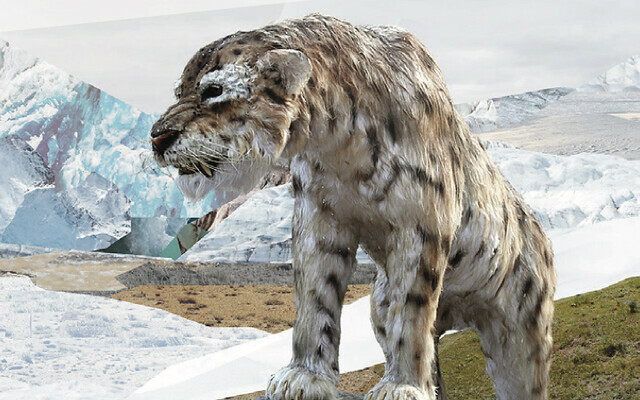 Based on Homotherium’s preference for open habitat such as plains and comparisons with modern cats, it is considered likely by ethologist William Allen et al that Homotheriumwould have been plainly colored like lions to better camouflage itself.